A remarkable device that can be used to remotely unlock and configure Daily Loyalty Chest Rewards using King's Credits. Activate it from the Special tab in your Inventory! 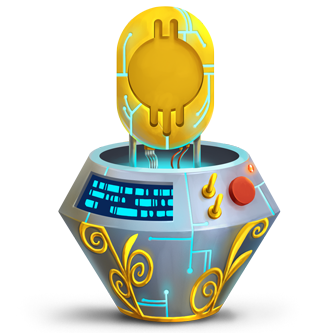 The King's Calibrator can be purchased from the King's Cart or King's Arms General Store for 1,000 gold. It allows Hunter's to adjust elements of their Loyalty Chests. Upgrades are purchased using King's Credits. The King's Calibrator can be accessed through the Special inventory tab, under Equipment, or through the Daily tab above the Hunter's Journal. Current Daily Rewards -- Shows what you will currently receive in each day's Loyalty Chest. Change Daily Cheese -- Hunters can buy upgrades that change the type of cheese awarded. Upgrade Daily Gold -- Increase the amount of gold awarded. Upgrade Gifts -- Increases the number of gifts sent and recieved through Gifting. This tab shows the Hunter what will be awarded in each day's Loyalty Chest. Changes made on the other tabs will be reflected here. Hunters can purchase upgrades that allow specific cheeses to be awarded in the daily Loyalty Chests. Gouda Cheese, which is awarded on days 2, 3, and 4, will be replaced by another cheese once an upgrade is purchased and selected. Upgrade purchases are permanent, but once purchased, the cheeses can be swapped out at will. Purchasing these upgrades will permanently increase the amount of gold in each day's Loyalty Chest. These upgrades must be made in order and their effects are cumulative. Making all 3 upgrades will result in an additional 4,000 gold in each day's chest. Purchasing these upgrades will permanently increase the number of gifts that Hunters can send and claim through Gifting. These upgrades must be made in order. 11 January 2016: The King's Calibrator is introduced. 23 January 2018: Crescent Cheese, Duskshade Camembert and Ancient String Cheese added to available cheeses. This page was last edited on 24 January 2018, at 15:17.